In 2017 we reviewed the technologies available for electrifying bus systems, comparing the performance, cost, and environmental impact of each in a New Zealand context. We then compiled our research into a public report to help Kiwis understand these technologies and what to consider when choosing among them. In summary, electric buses seem a promising way to reduce transit carbon emissions in New Zealand where a high proportion of transit ridership is delivered by bus and a high proportion of electricity is generated from renewable sources. You can read our full report here. In 2016 we conducted another round of research about electric vehicles, this time in an Australian context and in collaboration with Beyond Zero Emissions, an Australian, not-for-profit climate change solutions think-tank. We compiled into a report many of the benefits of electric vehicles, including the personalised benefits related to convenience, cost, and local pollution, and the broader benefits to society relating to reduced greenhouse gas emissions, energy security, and urban amenity. We also explored potential policy responses to address the various barriers to the uptake of electric vehicles in Australia. One key finding of this work is that a shift to electric buses is both feasible and affordable. You can read our full report here. We have also worked directly with manufacturers of electric vehicles. In 2015 Proterra, a USA maker of electric buses, engaged us to create a bus simulator for their sales team. 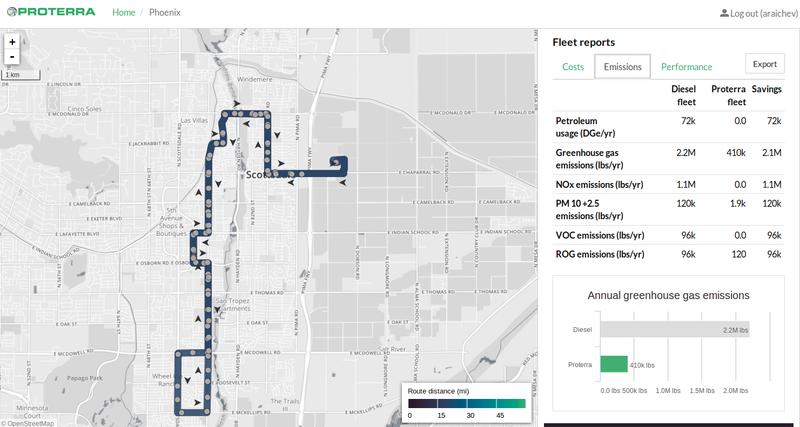 The result, EV Simulator, analyzes transit data in the form of General Transit Feed Specification (GTFS) files and applies Proterra's vehicle simulation logic to estimate the differences in costs, emissions, and performance between Proterra electric buses and standard diesel buses on each route of a given transit network. Using EV Simulator on a tablet computer aside their transit agency clients, Proterra's sales team can now quickly and visually demonstrate the advantages and disadvantages of deploying electric buses on specific routes. Will electric vehicles, and electric buses in particular, sweep the world and become the industry standard? We shall see and are excited to be involved in the changes afoot.